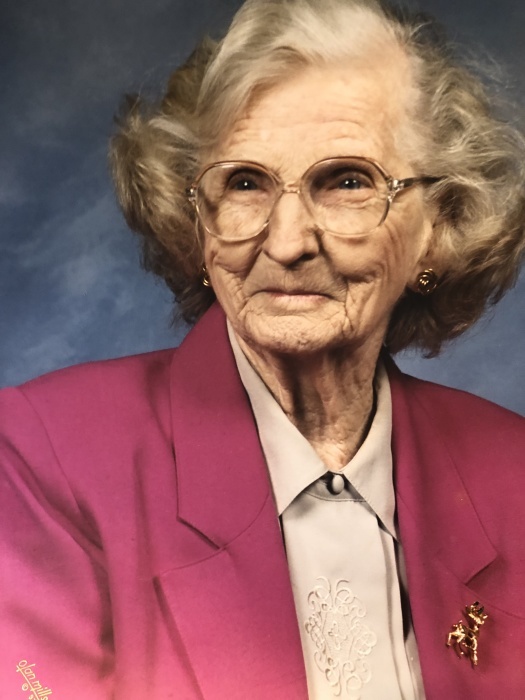 Ruth Josephine Brecht Booth, age 102, of Salvisa, widow of William Septamus Booth, died Tuesday, August 7, 2018 at her residence. Mrs. Booth was born in Covington, KY to the late John F. and Emma Schnockelborg Brecht. She was a homemaker and member of the St. Lawrence Catholic Church for over 70 years where she attended the St. Lawrence Altar Group and Women’s Group. Ruth is survived by two daughters, Marlene E. Yeager and Carolyn Booth, both of Salvisa; two sons, Ralph and Clyde Booth, both of Florida; five grandchildren, Carol Zupancic, Atlanta, GA, Cheryl Walker, Wayne (Karen) Yeager, and Bill Booth, all of Lexington, and Misty (Dominic) Gross, Hebron, KY; seven great-grandchildren, Ryan Zupancic, Atlanta, GA, Sarah Walker, Lexington, Taylor and Hunter Booth, Harrodsburg, Charlie, Avery, and Reese Watson, all of Hebron, KY.
She was preceded in death by two brothers, John E. Brecht and Charles Christopher Brecht. A funeral mass will be held at 11:00 a.m. on Friday, August 10, 2018 at the St. Lawrence Catholic Church with Rev. Jeff Estacio and Father Chris Clay officiating. Burial will follow in the Lawrenceburg Cemetery. Visitation 10-11 a.m. prior to the services. Casket bearers will be Ryan Zupancic, Wayne Yeager, Bill Booth, Hunter Booth, Seann Speray, and John Hockersmith. Honorary bearers will be Charles Gorham, Jim Speray, Richard Pohlman, and Russell Wayne Johnson. Memorial contributions are suggested to St. Lawrence Catholic Church, 120 N. Gatewood St., Lawrenceburg, KY 40342 or Heritage Hospice, 120 Enterprise Drive, Danville, KY 40422.